Hey guys. I've got an awesome giveaway for you today. Here is your chance to win all of Marie Lu's books: Legend, Prodigy, and Champion, plus the brand-new The Young Elites! Thanks to Big Honcho Media for allowing me to host. Check out this EXCERPT to get an idea of how great this book is going to be! Young Elites sounds amazing!! Instantly hit the top of my to-read list, love the covers! I read the first two of Marie's Legend series and have the third just sitting on my shelf, waiting to be read :) Thanks for the giveaway; I've heard great things about this one! I love the Legend trilogy!!! I've had them on my TBR list for a long time! I have not read any of her books, but I have seen them on the blogs and everyone enjoys them. I have two on my TBR list, but have not gotten around to them yet. I will have to change that soon!!!! I love the Legend trilogy! 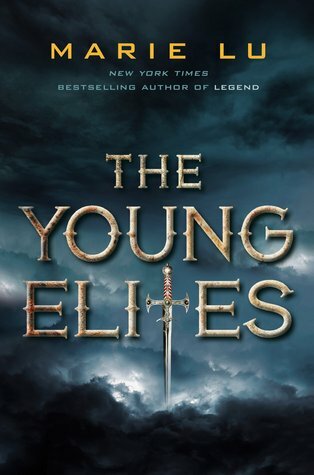 I want to read the Young Elites so badly! No, I haven't read any of her books. However, the covers catch my eye everytime I'm in the book store. No, though Legend is in my TBR pile. I haven't had the pleasure, but I am DYING to read them all!! Seriously, this is Luke the ultimate cool giveaway!!! Thanks!!!! I loved Legend, Prodigy and Champion. I'm so excited to read the Young Elites! I actually have Legend on my Nook, but I haven't read it yet! Thanks for this giveaway. I haven't had the chance to read any of these books, but I really want to. This would be an awesome way to get these books in my hands. Yes I read Legend and Prodigy. Still need to read Champion and I have been looking forward to The Young Elites. I haven't read Champion yet, but right now my favourite is Prodigy so far! I can't wait to read it! I've read legend which I love and prodigy which was awesome! Embarrassed to say I have not read any Marie Lu books! Legend has been in my TBR pile for awhile and The Young Elite's sound brilliant! I haven't read of her books but I've been wanting to for awhile! Yes, I adored Legend series. The ending was so beautiful written that it brought tears to my eye. Marie Lu is my favorite author now and I'll read whatever she writes. I have not read any of Marie's books, but I would love too. This series sound very exciting. Thanks for the chance!